Message From the President – Bicycle Friendly Delaware Act – What Does it Mean to Me? The Bicycle Friendly Delaware Act – also named “An Act to Amend Title 21 of the Delaware Code Relating to Rules of the Road” recently became a law in Delaware. I heard about it, but what does it mean to me, the cyclists? In June, 2017, after years of blood, sweat and tears the Delaware State Legislature passed legislation (20-1) for The Bicycle Friendly Delaware Act and sent it onto Governor Carney for action! Bill sponsors Representative John “Larry” Mitchell and Senator David P. Sokola were instrumental in getting the bill thru the House and the Senate and onto the Governor’s desk. Bicycle traffic signals defined and enabled as an engineering tool for DelDOT (specifically enables the Delaware Avenue Separated Bikeway in Newark). Most serious bicycle crashes occur at intersections. There is no more important safety countermeasure that Delaware could adopt to reduce serious bicycle crashes than the widespread adoption of bicycle traffic signals. Requires motorists to change lanes (including when there is a double yellow line) when passing bicycles when travel lanes are too narrow for side-by-side sharing (making “Three Foot” passing a requirement only in the special case of wide lanes). “As close as practicable to the right-hand edge of the roadway” (the dreaded “AFRAP“) also disappears from state code (replaced by “far enough to the right as judged safe by the operator to facilitate the movement of such overtaking vehicles unless the bicycle operator determines that other conditions make it unsafe to do so“) and, again, only as a special case for wide lanes. Motorists forbidden to honk horns at cyclists when passing except for imminent danger. General clarification of “where to ride” laws, including specifically permitting two-abreast riding within the lane in a narrow lane. The “Delaware Yield“: permitting/requiring bicyclists to yield at stop signs (when the coast is clear), instead of requiring a complete stop at all stop signs with no exceptions. A legal exception for safe yielding at stop signs by cyclists is an achievement that has eluded every other state cycling advocacy organization that has tried since Idaho in 1982 (including Oregon in 2003, 2009 and 2011, Minnesota in 2008, Arizona and Utah in 2011, Oklahoma in 2016 and Colorado, California and Arkansas in 2017). One of the keys to the near-unanimous passage of this legislation was the involvement, suggestions and buy-in from the Delaware State Police. This link to the House Bill 185 is provided for those that want to read and fully understand what went into law when the bill was signed into law when signed by the Governor Thursday, October 05. It is strongly suggested that you take the time to become familiar with this law. This link takes you to page that provides details about the Bill including sponsors, co-sponsors, who voted for and against it, committee reports, its original language, etc. The Bill signing on Thursday, October 05 was in Newark, Delaware. Please visit the Bicycle Friendly Delaware Act (BFDA) page of the Bike Delaware website for more information along with pictures of the bill signing. 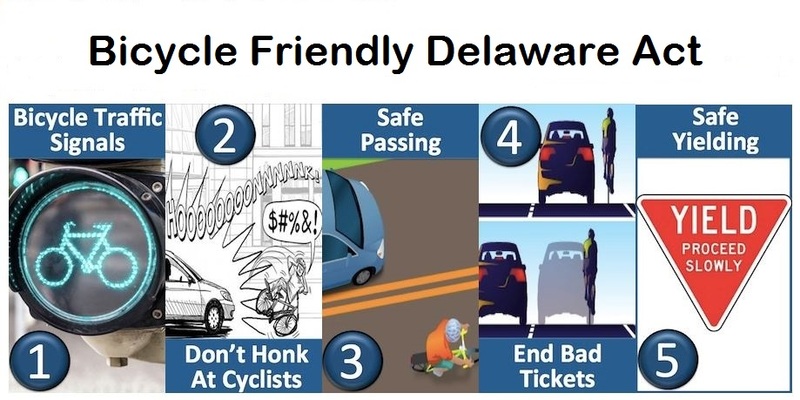 Some of the information above and the graphic used were borrowed from the Bike Delaware web site with their permission. Visit the BikeDE website for more information about the BFDA.